Just a couple of hours north of Reykjavik sits one of Iceland’s most precious gems. The Snaefellnes peninsula is home to many of the types of natural attractions that the Land of Fire and Ice is so well-known for. The concentration of snowy glaciers, black pebble beaches, extinct volcanoes, hidden hot springs, idyllic fishing villages, colorful lava tubes, stunning waterfalls, and hexagonal basalt columns all within a 90 km (56 mi) stretch of land has earned the territory its rightful nickname of Iceland in miniature. So what are the main sights to see on Snaefellsnes Peninsula? And can you visit on a day trip from Reykjavik with your Iceland car rental? Let’s get to know the zone in the western part of the island known as “Iceland in a nutshell”. If you’ve only got a few days in Iceland, this could be the perfect destination to maximize your vacation time. What are Some Things to Do in Snaefellsness Peninsula? If you’re an outdoor enthusiast, there’s a wide range of activities and things to do outdoors in the Snaefellsnes peninsula. 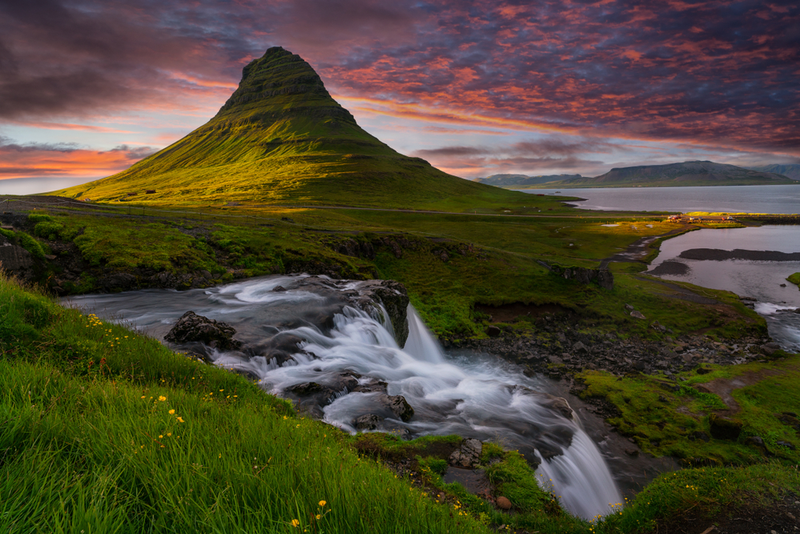 Probably the most iconic site to visit is Kirkjufell mountain and Kirkjufellsfoss waterfall. This arrowhead-shaped peak is said to be the most photographed mountain in Iceland, and for a good reason. The juxtaposition of the three cascades falling over the edge of the cliff and into the river bend set against the backdrop of the mighty mountain seem almost too beautiful to have been created by sheer coincidence. Perhaps this is why Kirkjufell mountain was chosen as a filming location for Game of Thrones. Church mountain, as it is known in Icelandic, is one that you definitely don’t want to miss during your tour of Snaefellsnes peninsula. Another obligatory stop on any visit to Snaefellsnes peninsula is Snaefellsjökull National Park. This natural reserve is home to the glacier which gives both the national park and the peninsula their names. Snaefellsjökull is actually an ice cap which sits atop an extinct volcano. The zone is home to quite a few tales of magic and mystery. For starters, there’s the electromagnetic activity which causes sleep disturbances to visitors. The area is also rumored to be one of the world’s seven chakra energy centers. And some have even claimed that aliens use the summit of the mountain as a meeting point. Kinda freaky, right? While we’ll never know if rumors of aliens and chakras are true, we do know that the volcano and glacier played an important role in Jules Verne’s 1864 seminal sci-fi classic Journey to the Center of the Earth. The book’s main characters Professor Otto Lidenbrock and his nephew Axel go on a geological expedition that leads them through a subterranean cave and tunnel filled with previously unseen wonders. They start their famous journey on Snaefellsjökull glacier, whose extinct volcano houses the entrance to the tube which supposedly leads to the center of the Earth. The region's colorful Vatnshellir lava cave is said to be the inspiration for this novel that is well-beloved in classical literature. Here are some other highlights of the peninsula when traveling counterclockwise from Borgarnes when driving in Iceland. A nearly circular volcanic crater formed by a massive explosion 7,000 to 8,000 years ago. A cool feature is that you can hike to the top of this 60-meter tall, 200-meter wide crater and peer in. That's around 197 feet tall and 656 meters wide. While it’s not so secret anymore, this hidden Icelandic hot pot is still worth a visit. You’ll have to hunt for it behind an abandoned old farm and be sure to get there early. It only fits two to three people, so you may have to wait to take a dip. Be sure to pack your swimsuit! Just up the road from the Eldborg Crater and the hidden hot spring at Landbrotalaug are the Gerðuberg Cliffs. These hexagonal basalt columns in West Iceland are visible from the road, so be sure to pull over before oohing, aahing, and snapping pictures. This church features the traditional Icelandic architectural style with a twist. It’s painted black with white windows and doors and is recognizable as Iceland’s black church. Home to a hidden waterfall, this canyon takes its name from a very intriguing story in the Icelandic sagas. It also makes for a lovely place to hike. These two little fishing villages are perfect for an evening rest or a take a short trek before continuing your journey. The 8,000-year-old lava tube is filled with colorful volcanic rock formations. You can only access it with a certified tour, so be sure to book in advance. This volcanic beach at the tip of the Snaefellsnes peninsula is famous for the dark pebbles on its shores that have been eroded by sea and time. It’s known as the black lava pearl beach. This is another quaint village that makes for the perfect last stop on your tour of Snaefellsnes peninsula. How Long Should I Spend in Snaefellsnes Peninsula? Ideally, I would recommend spending two days in Snaefellsnes peninsula. While it’s possible to see several of the highlights on the land mass during a day trip from Reykjavik, the area is much more suited for a weekend escape. The varied landscapes are much better explored when you have time to appreciate each area in depth. It’s quite easy to get to the peninsula. When coming from Reykjavik, head north on the country’s Ring Road until you get close to the small town of Borgarnes (a little ways past Borgarbyggð). After entering a roundabout, you’ll turn onto the Snaefellsnesvegur (Route 54). This will take you to the first stop on your excursion, Eldborg crater. This jewel in West Iceland offers some of the best that the small Nordic island has to offer. I hope you consider adding it to your Iceland itinerary. Let us know what you think about Iceland in miniature.